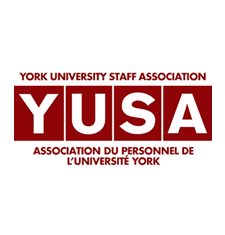 YUSAPUY (York University Staff Association – Association du Personnel de L’Universite York) represents thousands of workers at York University in Toronto, Ontario. The union was founded on December 10, 1975, exactly 27 years after the United Nations established the Universal Declaration of Human Rights. We achieved our first contract a year later in 1976, and throughout our history, have proudly represented the interests of workers on campus. YUSAPUY believes that all working people, regardless of race, gender, age, sexual orientation, nationality or religion, deserve greater security, respect and fairness on the job. YUSAPUY is a member of the Confederation of Canadian Unions, which strives to bring working people and independent unions together to establish more equitable and democratic workplaces throughout the country.